Former Ateneo professor wants to bring back Roxas to replace Duterte? 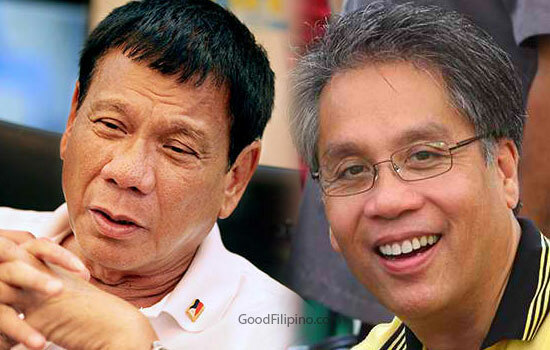 Home » Christina Astorga » Mar Roxas » Open Letter » Politics » President Rody Duterte » Rodrigo Duterte » Former Ateneo professor wants to bring back Roxas to replace Duterte? Prof. Christina Astorga has new controversial remarks for the 16th president of the Philippines. She do not want to stop from giving her opinions against the new president of the country. The former Ateneo de Manila University professor said that it is best to bring back Mar Roxas as a crime buster compare to Duterte's vigilante justice. Citing the news that the new PNP Chief Ronald 'Bato' dela Rosa acknowledges the effectiveness of the 'Oplan Lambat Sibat' in which brainchild by the former DILG secretary Mar Roxas. Prof. Astorga said, "Bring back Roxas' Oplan Lambat Sibat, or better still, bring back Roxas! He is the more intelligent, strategic, and effective crime czar than Duterte! And he operates within the law and he does not need emergency powers!" "CALLING ROXAS' STRATEGIC AND EFFECTIVE OPLAN LAMBAT SIBAT. STOP DUTERTE'S BLITZKRIEG VIGILANTE KILLING! IT IS UNCONSTITUTIONAL, ILLEGAL, AND IMMORAL," she said. The professor who is now currently residing abroad wants to 'STOP' Duterte's blitzkrieg vigilante killing. She told on her Facebook post on June 3, 2016. "Stop Duterte's blitzkrieg vigilante killing that is unconstitutional, illegal, and immoral. Duterte is giving all citizens license to kill on mere suspicion. The poorest among us will be most likely the victims of false arrest and false executions. The rich can buy guns, hire lawyers, and also hire security guards to provide 24 hour protection. The poor will be defenseless victims of brutal violation of their right to due process and just law. When everyone is given by the president license to kill on mere suspicion, a lawless society is created. Is this president in his right mind. We have a killer president who seems to be trigger happy. Kill, kill, kill is his mantra! "Calling Roxas' effective Oplan Lambat Sibat. It was effective in reducing crimes according to PNP! It reduced crimes in Metro Manila by 60% since June 2014 when it was first instituted. The cases of crime came down from 900 to 300 in August 2015. 146 of the 440 most wanted drug suspects were arrested in just 6 weeks! "Why is Oplan Lambat Sibat effective? It employs intensified police intervention like putting up checkpoints; it deploys mobile and foot patrol, and it engages in intelligence-driven operations. Roxas cites the three strategies that Oplan Lambat Sibat engages in-- First, it audits the police blotters; second, it geo-tag crimes by location; and third it concentrates operations in places with the high incidences of crime. With these strategies, everyday, of 900, less than 500 people are not victimized by crime according to reports. "The difference of Roxas Oplan Lambat Sibat and Duterte's Vigilante Killing is that Oplan Lambat Sibat is within the law. It employs only those with professional license and training to deal with crime. It is based on methodic intelligence work, coupled with strategies to effectively reduce crimes. Duterte's vigilante killing is extra judicial-- it is outside of the law-- unconstitutional, illegal, and also immoral. It violates due process and fair trial. It is not based on methodic intelligence work. It is "bara bara".. Just shoot to kill on mere suspicion. And Duterte is giving all citizens license to kill, and certainly includes those who are trigger happy! 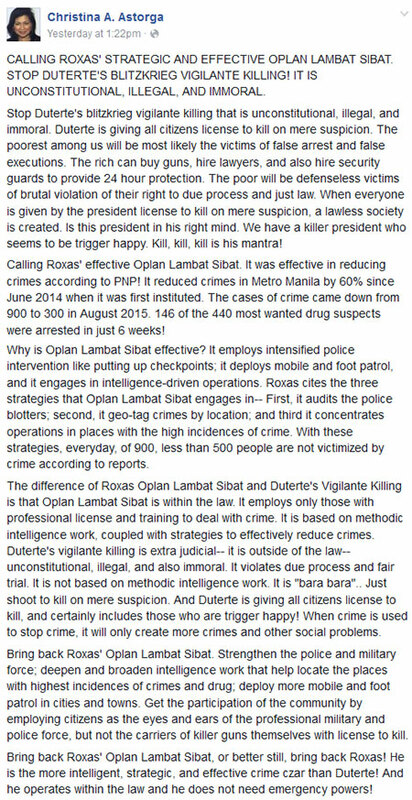 When crime is used to stop crime, it will only create more crimes and other social problems.."
"Bring back Roxas' Oplan Lambat Sibat. Strengthen the police and military force; deepen and broaden intelligence work that help locate the places with highest incidences of crimes and drug; deploy more mobile and foot patrol in cities and towns. Get the participation of the community by employing citizens as the eyes and ears of the professional military and police force, but not the carriers of killer guns themselves with license to kill." What can you say about her statements against President Duterte? Please took the comment box below and share your feedback about the topic. Comments or suggestions about "Former Ateneo professor wants to bring back Roxas to replace Duterte?" is important to us, you may share it by using the comment box below.